Back in 2006, the White Stripes’ Jack White, solo artist Brendan Benson and The Greenhornes rhythm section of bassist Jack Lawrence and drummer Patrick Keeler released Broken Boy Soldiers, the soundtrack of four immensely talented friends hanging out and writing and recording music. Soldiers was a gem of an album. It clocked in at about 35 minutes, full of tight performances and gritty work. Along with Pearl Jam’s eponymous disc, it was one of the great records of 2006. Two years and one White Stripes album later, they have returned with a more serious effort. Consolers Of The Lonely is the band recording in a professional studio (as opposed to Brendan Benson’s attic), and taking the time to write songs. The result is the best album of 2008 so far and, barring a miracle, the best album of 2008 when the calendar rolls around to January of 2009. While Soldiers was a great, loose recording by four friends, Consolers is the sound of an actual band firing on all cylinders. Soldiers sounded like a side project for the musicians involved; Consolers sounds like a mission statement. Where the songs on the first album sounded, in some cases, like sketches and ideas, the songs here sound like they’ve been crafted with loving hands. The fact that at this point in time both White and Benson seem to be in the zone where everything they touch turns gold certainly helps. Over the course of the next 55 minutes, the Raconteurs open up the textbook about everything good in rock music. Three part harmonies; swapped lead vocals, guitar crunch, punchy horn sections, a mix of rockers and ballads, cool lyrics, diverse instrumentation, great melodies. If you are a fan of rock music in general, and not hung up on one genre or another (“I only listen to Metallica, man!”), then there is absolutely nothing on this album not to like. Every song should please the average rock music fan. It is more melodic than the White Stripes (thanks to Benson), heavier than Benson (thanks to White), and has a rhythm section most bands would kill for. Benson and White complement each other as perfectly as Lennon and McCartney. Lennon was the literate rocker who wrote some great ballads; McCartney was the consummate romantic balladeer who wrote some brutally heavy rockers. 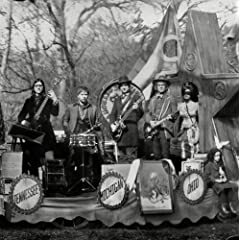 Similarly, White brings the heavy to the Raconteurs while also writing great ballads and melodies, and Benson brings a golden ear for melody, a rich strong voice, and a willingness to turn the amps up to 11. Or even 12 in some places. Together, and all but one song are co-written by White and Benson, they have written the finest songs to appear on a rock album in years. From the Sergio Leone feel of “The Switch and the Spur” to the riff-o-rama of “Salute Your Solution” and the title track to the neo-soul of “Many Shades Of Black” to the intense balladry of “You Don’t Understand Me” to the manic “Five On The Five” to the smartly chosen cover of Terry Reid’s “Rich Kid Blues” to the epic Gothic murder ballad/story-song “Carolina Drama,” Consolers Of The Lonely is as close to perfect as an album gets. Not only are there no bad tracks, there are no missteps at all. This is smart rock music, lovingly crafted, and meticulously recorded. This is not simply a good album or even a great album. This is a classic album. Just thinking, I can remember when he was Dean R. Koontz. I wonder whatever happened to that. At this point, having read every Dean Koontz book except the two most recent (still in hardcover) and the eleven or twelve he has ready to release in the next six months, I’m not even sure how to review it. I guess I’ll start with the simplest statement. It was a thoroughly enjoyable book, a quick read (about 450 pages in a couple of days), and by tomorrow I will have forgotten what it was about, just like I can’t for the life of me remember what the plot was to Dark Rivers Of The Heart, Mr. Murder, The Face, or The House Of Thunder. Dean Koontz books are the literary equivalent of James Bond movies. Some are excellent (Casino Royale), some are good (Diamonds Are Forever), some are wretched (Moonraker). Almost all of them have the same basic set up. The above description fits about 85% of Dean Koontz’s books. It’s a formula. The downside of this is that his most of his characters are essentially interchangeable, and most of the set pieces of the plot can be swapped from novel to novel. Is there any difference whatsoever in the chase scenes between The Good Guy and, say, Dark Rivers Of The Heart? Nope, not really. However, it’s a good formula. It works and provides for a nice, easy read. Mom’s apple pie is made the same way every time, with the same ingredients. But damn, it’s tasty every single time. This is a mid-level Dean Koontz book. It’s far superior to his lazy efforts like The House Of Thunder or The Voice in the Night, but not up to the level of the books where his formula includes honest-to-God inspiration (Dark Rivers Of The Heart, Hideaway, Phantoms, Whispers, Darkfall, Strangers, the “Odd Thomas” books) or where he breaks from the formula (Intensity, The Taking). Looking for a nice light read for the beach? The Good Guy satisfies nicely. Looking for something challenging that will make you think and reassess the nature of God, man, and nature? Stick with Tolstoy.